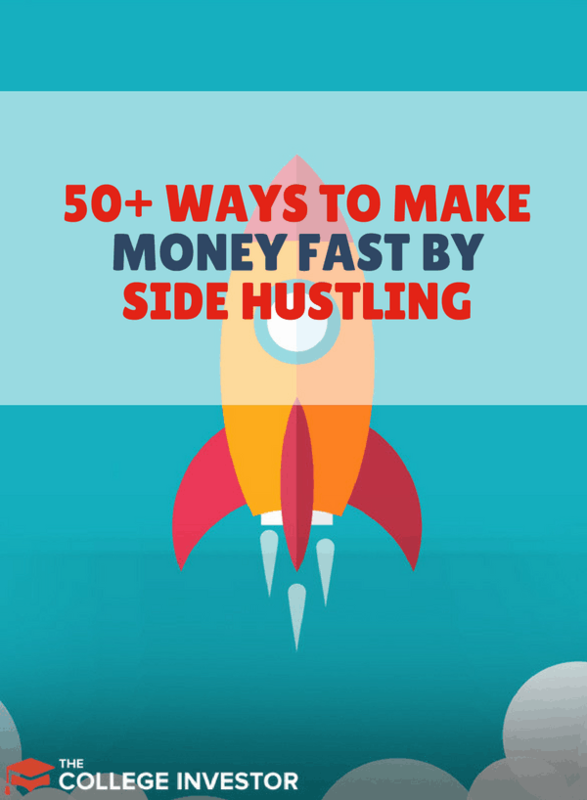 There are millions of ways to make money - especially extra money side hustling. If you have the drive and the passion to earn money, you CAN do it. But sometimes we struggle to figure out what to do that will actually earn us anything. We simply hit a mental wall and our money-making ideas remain out of reach. 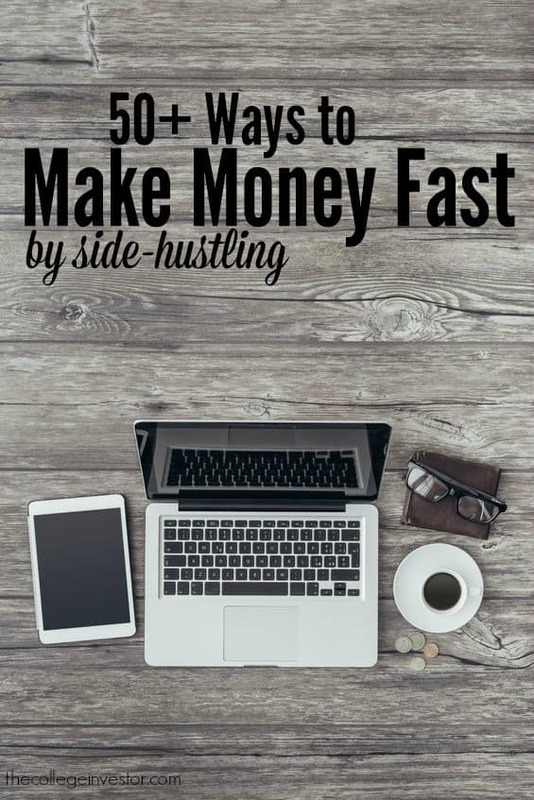 So, instead of staying roadblocked, here is a list of ways to start side hustling, earning your way out of debt, or using extra money to invest. No matter what your skill set is, or how much time you have, you should be able to find something on this list that you can do this week to make some extra money. Even (and perhaps especially) if you're a college student looking to make more money, a lot of these tasks are perfect for you. Please note that some of the links below are affiliate links and will earn me a commission. These are all things that I have experience with and I am recommending because they are helpful and are companies that I trust, not because of any commission it may earn me. Food for thought - this site started on Bluehost and was soon earning over $1,000 per month. It's grown much more since then. We love Bluehost because you can get started for just $2.95 per month with our special code. Check it out here. Survey Junkie - Earn cash and rewards for sharing your thoughts and opinions. Click here. Swagbucks Surveys - Swagbucks now has a dedicated survey section, and you can get $5 just for signing up. Click here. MyPoints - Earn a $5 giftcard for signing up, verifying your email, and for every 5 surveys you complete. Click here. Opinion Outpost - Earn cash for filling out surveys. Lots of options. Click here. Springboard America - A newer site with no bonus but solid payouts inside. Click here. mySoapBox - Share your thoughts and get paid for it. Click here. Special offer for 18-24 year olds: PineCone offers unique high paying surveys for just your age group. Check it out here. If you're a guy, here's a special deal for you. Swagbucks Males has a special survey promo for guys, who are in demand. Plus, you get a $5 bonus as well. Click here to sign up. If you sign up for Swagbucks through THIS LINK you can earn a $5 bonus! Do you have old books, CDs, or DVDs? Then you should consider selling them on Amazon. It's incredibly easy to list your items to sell, and you'd be surprised how much you can get for old stuff sometimes. If you're a college student looking to sell your old textbooks, you should compare the Amazon prices to your bookstore buyback prices. Amazon is often a better place to sell. I've been regularly selling my old stuff on Amazon for about 8 years. It can be a great side hustle. Fiverr is a micro-selling site where you can sell all kinds of random projects, from design work to simply recording yourself on video talking about a brand. We just wrote an article about how you can earn $10,000 by starting a Fiverr gig. It's possible! A cool gig that I recently purchased was a woman who was selling travel plans. She'd traveled to many cities and was passionate about planning, and would make a travel plan with sites to see, entertainment, restaurants, and more. It shows that there are gigs for everything! eBay is a great place to sell stuff and earn money, especially if you have something collectible. At my peak, I was making over $2,000 per month buying items and reselling them on eBay. You can read my full story about starting a side hustle and selling on eBay here. You could open a shop on Etsy and sell your crafts to others who are looking for unique products. You could sell paper goods like cards and invitations, or even home decor products themed around the holidays. My sister in law regularly sells items on Etsy. She creates stationary and other decor and sells them. For the investment in her time and minor costs of crafting supplies, she's able to generate a decent side income. Beyond blogging, you can also become a coach or consultant for others, especially if you have some skills that people are looking for. Maybe you're a social media maven, or you have great online business skills. Selling your time and hopping on a Skype call or Google hangout is a great hustle. A good platform to get started with this is Clarity.fm. You can get paid by the minute for your consulting calls. If you've established yourself as a thought leader in your industry, you could also make yourself available on platforms like LinkedIn as well. There is a lot of freelance work online. You can sign up for sites like UpWork, or you can even become your own online freelancer like I did. I've made over $10,000 on the side by online freelancing, and I share my story, as well as resources to help you get started, here: How To Start Freelance Blogging and Earn $1,000s on the Side. One of the more popular ways to make money freelancing right now is by doing SEO consulting. If you're a little savvy and analytical, you can make $75/hr or more. Check out this free SEO Consulting Course to get started. For podcasters, having a great transcription can be huge. When you hear the term "show notes", who do you think helped put that together? Learn how to transcribe from home here. I've met several authors you've never heard of that sell tons of eBooks on Amazon every year. One author has almost 100 different books he's selling on Amazon. If you don't want to put together a blog, you could go this route of selling your content online. Perhaps taking pictures is your forte. If you are a great photographer, you could possibly sell your photos online. Sites like iStockPhoto are always looking for contributors, who get paid a royalty every time their photo is purchased. This could be a great way to turn your art into some extra cash. Even if you don't like to take pictures, more and more stock photo sites are also looking for digital art as well. If you're strong at creating digital images (like the one we've used for this article), you could also consider selling your work. Another micro-task site is Amazon's Mechanical Turk. The gigs on this site pay incredibly low amounts - less than a nickel typically. However, they take seconds, and you can earn around $6 per hour if you keep at it. This is one of the first side gigs I started doing in college. I would sit in the back row of my college class while on my laptop, and do random tasks on Mechanical Turk. I wouldn't make much, but I'd make something. Did you know that you could get paid to try out a new website and give feedback? Do you have something you can teach? You can teach something online at sites like Udemy.com. There are courses online for just about anything, and you can charge whatever pricing you feel is right for your instruction. You'd be surprised on what topics are out there that people want to learn about. Maybe you don't think that you can teach anything, but it's possible that you have a skill that others want to learn. Do you enjoy writing, social media, and blogging, but don't want to start your own blog? You can find virtual assistant jobs where you help other people run their sites and social media accounts. Depending on the amount of time you have, this side hustle could even become a full time gig. I've been using virtual assistants to help me with this website for years. It's great to have someone help me with tasks throughout the week and keep the blog on track. You can make great money as your skillset improves as well. Are you a teacher? Or do you at least have a bachelors degree from an American college or university? If so, you could teach children in other countries English online! VIPKid is an innovative platform that connects native English speakers that have a degree with children in other countries like China or India. You can setup a "class" time, and people will sign up for your class online. You get paid when you teach. The cool thing is that teachers are making $14-22 per hour online, from the comfort of their own home! Another similar service is QKid - where you can teach English even if you're just enrolled in college! 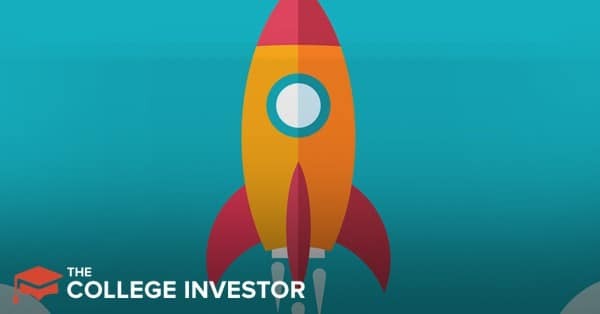 These ideas are a little different than the typical hustle - they are more based on entrepreneurship and asset leveraging to make even more money for you. These can lead to passive income over time if done well. Don't like the idea of having people in your car? Then maybe delivering food is the best avenue for you to take advantage of your car and make extra money. One interesting thing about delivering with UberEats is that you can have other people in the car, since you're only delivering food. This is a great gig for families - you can have the kids in the car while the parents work. The ultimate side hustling multi-tasking gig! More and more restaurants are signing up, so you can likely find gigs in your area. Similar to Uber, except you're delivering food instead of people. PostMates is an on-demand delivery service where you get paid around $20 per hour to deliver food. In fact, right now you are guaranteed to earn $1,000 per 60 deliveries in New York or San Francisco. That's not bad. The only problem is that it's not everywhere yet. However, they are adding more cities all the time. If you travel a lot, you have the potential to list your house while you're away on Airbnb. Or, maybe you have a spare bedroom, loft, camping area, or other place where people can stay. Do you have a vehicle that you're not using a lot that you've thought, "hey, wouldn't it be great if I could be earning some extra money versus paying on that..."
Well, with a service like Turo, you can do just that. Turo allows you to make your car work for you - by listing it for rent in as little as 10 minutes. Getaround is another renting service that is a bit newer that Turo but gaining traction. Sometimes, working offline when you side hustle is a more lucrative prospect - especially depending on your skill set. However, these gigs don't mean you'll never touch a computer. You might still need to list your side hustle project online or market it online to get leads and customers. If you want to make $75 to $200 per hour long appointment working for yourself on your own schedule, be sure to get the proper training. One of the top rated courses we found that is really impacting how people make money is Loan Signing System. Loan Signing System is an A to Z course that teaches you how to get your notary commission, how to do a loan signing, and how to get loan signing jobs. Here’s a complete rundown of why it’s a great side hustle for part-time work. TaskRabbit.com is a place where you can sign up and run small tasks for others. It can include anything from picking up the groceries to cleaning or helping people move. Typical tasks take a few hours, but there are a lot of tasks available in most large cities. Do you want to side hustle just on Friday and Saturday nights? Well, you should team up with a catering company, as they often need servers and wait staff just for the events they host on the weekend. Many companies are "call-in", which means you can work when you choose to. If you don't know where to start, head to the Craigslist Gigs section where jobs like catering help will be posted. You can earn a nice flat fee per event. Plus, with a new service that Amazon has launched (Amazon Home Services), it's easier than ever to get these kinds of gigs. The great thing about it is that can earn you upwards of $100 per night! Many people start baby sitting in high school, but there's no reason that college students and other young adults can't keep in the game, especially if you have neighbors or relatives with young children. Plus, with online services to connect sitters with parents, it's easier than ever to get bookings. Are you tech savvy? Maybe you can help your friends and neighbors with computer repair, from updating and installing the latest operating system to helping them get a virus off their computer. If you have the know-how, people will pay. However, it takes a bit more than know-how to be successful. You also have to have the patience to work with older people who need the help and don't understand technology well. If you want to take it up a notch, look for recycling metal and scrap to get even more money. This is even easier if you have a truck and are willing to haul for others. Are you working at a company right now and see a lot of resumes? Do you hire people? Maybe you're in HR or a hiring manager. If you don't know who's dog you could walk, online services are making it even easier to connect with clients. And if you're willing to pet sit for long periods of time, you could make even more money! To be successful, though, you're going to need to get some friends involved to help. Do you have a knack for home repair? Then you could side hustle as a handyman on nights and weekends to earn a little bit of extra money. Just be up front about your skills set - repairing fences, doing small plumbing jobs, whatever it happens to be. One of the easiest side hustles to do: simply sit and sleep in someone's house while they are out of town. This is a great side hustle, but too bad it's usually not a consistent revenue stream for most. The only part is - it does take time out of your life. You're committing your time to being in someone's house and taking care of things. If you don't know where to start, online services like Care.com make it easy to connect with people looking for house sitters. Don't have a truck? You could work at a hauling company and do the manual labor for others. You can find all sorts of these labor gigs online. For many models, there isn't always a steady stream of work, but if you have success at a few gigs, this could become very lucrative. Check out our jobs for college students job board and see if there are any gigs near you. If you don't know where to start, check out online classified ads. Depending on where you live, you could become an extra on a TV show or movie. Many studios are always looking for a steady stream of extras, and you can get paid a couple hundred dollars for just standing or walking around in the back of a movie set. The cool thing is that mystery shopping has transitioned almost exclusively online. You can do most mystery shopping on your smartphone. Check out these apps to get started. If you love pets, taking care of your friends' and neighbors' pets while they are out of town can be a great way to earn some extra cash. It can be fun to make a new furry friend and get paid for it at the same time. The only hard part of pet sitting is that you're waiting for people to travel, which can be tough. Luckily you can use the Internet to help you find customers. Rover is an app that connects pet sitters with those looking for help. Check it out here. Have you walked through a college campus and seen the flyer for research studies and focus groups? Companies are always looking for people's opinions about products and services, and for sitting in one of these groups for a few hours, you could earn upwards of $100. If you have time on the weekends, and are okay lifting heavy boxes and furniture, you could join up with a moving service and get paid to help people move. It's not easy work, but most people tip the movers as well. This is another one where if you don't know where to start, check out online classified ads. A lot of entrepreneurs got their start mowing lawns, and it's still a great side hustle today. If you live in an area where people need gardeners, knock on doors and offer your gardening services. It's a great way to earn some extra cash. If you don't know where to start, check out online classified ads. There are always gardeners looking for help with their existing projects and clients. Painting services are another common side hustle for college students. If you have time on weekends and during the summer, you can paint houses or join a painting company. It's not easy, but it can pay well in the right neighborhoods. If you don't know where to start, check out online classified ads. There are always painters looking for laborers to help with their existing projects and clients. If you don't know where to start, check out online classified ads. There are always existing pool cleaners looking for help with their existing projects and clients. Did you know that you could actually be paid to be someone's friend for a period of time. We're talking strictly platonic stuff here (although we've heard that being a sugar baby can be extremely lucrative). Check out RentAFriend and see if you can find a friend that will pay for your time. In the winter, shoveling snow can be a lucrative side hustle depending on where you live. If you're able bodied, have a truck, shovel, and/or snow blower - you could earn a nice side income. While you used to go door to door and see if your neighbors wanted to pay for your services, there's now an app that can help you find work and get paid. This is one of the more interesting ways to make money. You go to your local blood bank or plasma donation center, and they will pay you a small fee for your blood plasma. It doesn't sounds amazing, but if you need extra money, this could be a great way to earn it. You can expect to be paid anywhere from $20 to $50 per donation. A recent study that a friend participated in was to get her knees numbed over night - a different numbing drug in each knee. She then had to tell the doctor which one wore off first the next morning. Odd, but it paid over $1,000 for one night. Sometimes, side hustling isn't about starting something else, but it's really about making better use of the job you currently have. These examples below are ways that you could potentially earn extra money at work - without doing any of the "stuff" we've talked about to this point. If working online or doing odd gigs isn't your thing, don't forget about these more "traditional" ways to make extra money. They're still side hustles! If you are working at a job, this might not be a true side hustle, but it is a way to earn some extra money fast. In many companies, you can volunteer to work longer and earn extra pay. If you don't have an idea on what side hustle to do right now, this could be an option. I remember when I was younger I would always volunteer for the overtime opportunities. Not only did you get paid well, but you would stand out to your manager, which would also reward you at review and raise time. Many companies also offer tuition reimbursement programs to help pay for school. Maybe your short term hustle is to better your education. Why not have your company pay for it while you're at it? Finally, if you don't want to work for yourself, go spend your time hustling for someone else at a part time job. While not ideal for some, it can be a great way to earn some extra money in your spare time. Career accelerators like Pathrise are a way to jumpstart your career and increase your starting salary. Pathrise, which provides people early in their career with one to one coaching and tools tools to get a better, higher paying job, can help you get an increased salary of over $12k for fellows who complete their 8-12 week part-time program. Have you tried any of these side hustles? What's worked for you and what hasn't? What did you use the extra money for? With online side hustles, you’d have to build a reputation before people start taking you seriously, and that takes time. Great point about the time commitment. A number of the ideas listed will take more time than others to really get going or even start earning you income. There are so many side hustling opportunities available. I have a side hustle that I’ve been operating for four years. It has been a game changer for my families finances. What’s the side hustle all about please if you don’t mind share with us ? On the redeem page, one of the options should be PayPal – and you can cash out there. Many “not qualifying” either didn’t start immediately, or missed one of the three criteria above. If you start making PSLF progress, who cares what your loan balance grows to since it will be forgiven tax free. I’ve been doing this for the last two years as a side hustle. It replaced my previous side hustle which was DJ-ing. Less money as a casino dealer but it is less of a time commitment and no lugging around heavy equipment. I just show up to the event deal a couple hands of cards for 2-3 hours and then go home with a check in my hand.